Click on your name and role in the gray Main Menu bar at the top of the page. 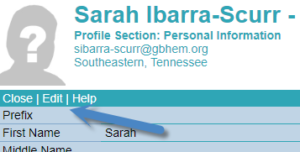 Select the Edit hyperlink in the teal table header on the Profile page. When the table opens, update the needed information. Note: Information entered in the Candidacy Application Form does NOT update the personal information section in UMCARES.